The Zinkgruvan mine is an underground zinc-lead-silver mine owned and operated by Lundin Mining and located approximately 250 kilometres southwest of Stockholm, Sweden. This low-cost mine has been producing on a continuous basis since 1857. 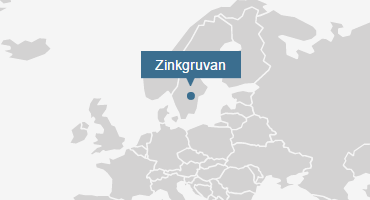 Zinkgruvan employs a conventional underground crushing, grinding and flotation milling process producing zinc and lead concentrates, which are transported via ship to smelters in Europe. Overall mine capacity was increased by approximately 10% in mid-2017. Current capacity is now 1.35 Mtpa. A separate 0.3 Mtpa copper treatment line in the processing plant was commissioned during 2010. This line was further modified during 2011 to allow it the flexibility to treat zinc-lead ore as well as copper ore. The Zinkgruvan orebodies are dominated by sphalerite and galena and are generally massive, well banded and stratiform. Remobilization of galena and silver has occurred in response to metamorphism and deformation, and is most pronounced in the lead-rich western extension of Nygruvan and in the Burkland area. Copper stockwork mineralization has been identified in the structural hanging wall of the Burkland deposit. Chalcopyrite is the main copper mineral and occurs as coarse disseminations and patches within a marble host rock. Current mineral reserves are sufficient for a mine life in excess of 10 years and excellent opportunities for ongoing reserve and resource expansion exist at Zinkgruvan. Historically, the mine has been very successful at resource conversion. In December 2004, Wheaton Precious Metals entered into a silver purchase agreement with Lundin Mining to purchase 100% of the life of mine payable silver produced at the Zinkgruvan mine for an upfront cash payment of US$50 million in cash, 6 million Common Shares and 30 million Wheaton Precious Metals Common Share Purchase Warrants (equal to approximately US$78 million), plus a payment equal to the lesser of US$3.90 per ounce of delivered silver (subject to an annual inflationary price adjustment) and the then prevailing market price per ounce of silver. For more information about the Zinkgruvan mine, please visit Lundin Mining’s website at www.lundinmining.com. Cost quartile information is sourced from Wood Mackenzie byproduct cost curves for gold, zinc/lead, copper, nickel, and silver mines.